I hope you had a good weekend! I'm glad you could stop by and see what's cookin' in the Kitchen this week Speaking of cooking, I made Betty Crockers Better than Almost Anything Cake for my family over the weekend, and I don't think I've ever seen anything disappear so fast! So why am I talking about cooking, well it does fit in with my post today. You see, I'm multi-tasking again this week, combining my Kitchen Sink Monday post with MJ's Techno Stamper Sketch. This weeks sketch is to make an Apron Card. After many searches looking for the perfect Apron Pattern, I decided to use my Stampin' Up! Oval Punches to create the Arm and Neck openings. My first thought was to use Spellbinders Oval Dies, which in fact I did on my mock sample (which BTW hit the garbage can), but it was late and I was having "issues", thus the easy stampers way out - punches! I used the Drywall Stitching Technique and a Black Marker for my stitching. Drywall Tape works relatively well around the arm and neck holes, you'd be surprised! For my stamped images I used Kitchen Sink Stamps Multi Step Berries, stamping the berries as follows: #2 Real Red, #3 Ruby Red, #1 Red stamped off once; the stems #2 Garden Green, #1 Garden Green Stamped off. The sentiments were stamped in Black Archival using a SAMJ. If you can't read the sentiment on the DSP, it reads "the Fruits of Summer". (click to enlarge) Don't forget, you can SAVE 10% on all Kitchen Sink Stamp purchases when you use code LISA10KSS - feel free to pass it on! Want a chance to WIN some KSS products? Get out your Kitchen Sink Stamps and play in this months KSS Challenge, you have until 7/24 to enter! I love the apron Lisa! It totally reminds me of the Betty Crocker Cook Books. Summer Fun! I love this Lisa! The stitching is great, the pattern is fabulous, the stamps are wonderful and you did a great job combining challenges again. Thanks so much for playing along. What could be better to adorn your apron than these luscious fruits of summer??!! A sensational creation so perfectly crafted, Lisa!! Such amazing work! So very adorable, Lisa!! Love the lacy border punch!! Totally cute! 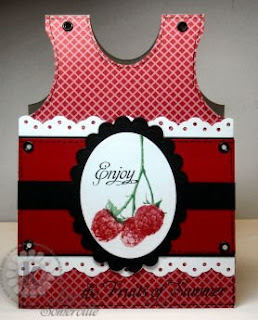 The paper and eyelet border punch are PERFECT for an apron...love how you got your pattern! Super darling! Very pretty, love the lacy border to make the apron look older! Great job! This is sooooo pretty, Lisa!! Love the apron shaped card! I'm so inspired!! This is a great card - those raspberries look good enough to eat. WOW!!! Fabulous apron card Lisa! The red & black with your layout and DP is such a striking combinations! Awesome job! What a great look, Lisa! Such happy colors and patterns....and a great idea for using the punches. The fruit images are a perfect match for an apron card, Lisa!